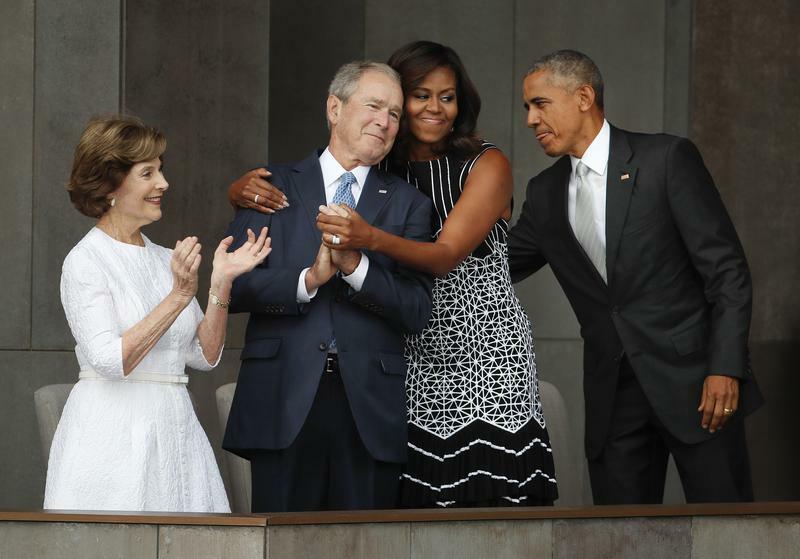 First lady Michelle Obama, center, hugs former President George W. Bush at the dedication ceremony of the Smithsonian Museum of African American History and Culture in Washington, DC, Sept 24, 2016. BROOKE GLADSTONE: Fifteen years since the start of the Iraq War, we live in what many see as a fresh hell, the erosion of institutions and standards at the highest levels. But political science professor Corey Robin says that our failure to draw connections between Trump and what came before is part of a larger pattern of forgetting America's political culture. COREY ROBIN: I first began noticing IT during the run-up to the November 2016 presidential campaign, most prominently at the Democratic National Convention where Ronald Reagan was resurrected among Democrats as a kind of hero, somebody to counter pose against Donald Trump. Since then, that tendency to reinvent conservatives past has grown only stronger. BROOKE GLADSTONE: In your article, you focus on various rehabilitations of history or reassessments or re-imaginings, and the most obvious example, for you, anyway, was George W. Bush. COREY ROBIN: Yeah, not just for me, [LAUGHS] actually, even Saturday Night Live took notice of this. WILL FERRELL AS GEORGE W. BUSH: So I just wanted to address my fellow Americans tonight and remind you guys that I was really bad. BROOKE GLADSTONE: Right. You wrote that when Bush left office in 2009, he was widely loathed. [LAUGHS] He had an approval rating of 33 percent, and today it’s 61 percent, and a lot of that comes from Democrats and independents. COREY ROBIN: And not just Democrats and independents, also younger voters who really loathed Bush during the Iraq War and the Bush years but now look back on him fondly. He seems to represent a kind of different conservatism from the one that we have today. One of the most shocking images to me was a photograph that was taken of Michelle Obama with George W. Bush, and in that she's hugging him and their faces are nuzzling together and she expresses what seems to be a genuine affection. And it's one thing to read statements and make statements about people, some of whom are no longer with us, it's, it’s one thing to welcome somebody into the fold from a long, long time ago, but that wasn't that long ago. BROOKE GLADSTONE: Here's George W. Bush talking about his friendship with Michelle. GEORGE W. BUSH: …surprised everybody. That’s what’s so weird about society today, you know, that people on opposite sides of the political spectrum could actually like each other. BROOKE GLADSTONE: I mean, that's nice, isn’t it? COREY ROBIN: It’s not just a personal moment between two individuals. Michelle Obama is a leading voice of the Democratic Party. What that is really saying is bygones are bygones, the past is the past. And meanwhile, we live in a country that is still in Iraq. This is a mistake that still lives with us. The veterans who have had limbs blown off, the people of Iraq who have endured what they’ve had to endure, what does that say to them? BROOKE GLADSTONE: And you see this as part of a much broader pattern. You cite Philip Roth who wrote during the Nixon years that there was a sense of living in a country with a government morally out of control and wholly in business for itself. And then ten years later he wrote about the era that Watergate made life interesting when I wasn't writing but from 9 to 5 every day I didn't think too much about Nixon or about Vietnam. And now when he compares Trump to Nixon, he says that Nixon wasn't anything like as humanly impoverished as Trump is. COREY ROBIN: You see two things that are going on there. One is an insistence that whatever you're currently confronting is something we've never seen before, on the one hand, and then, on the other hand, the very person who ten years ago you would have been reviling in exactly the same terms suddenly becomes anodyne, human, a man you'd want to hug. There's a relationship between those two things. One makes the other possible. BROOKE GLADSTONE: You were making the point that Trump isn't so different from what happened in the past, and people were really upset with you for normalizing Trump and you found this perplexing, until your wife explained it to you. COREY ROBIN: As my wife explained it to me, people, instead, heard me as saying, you know, this guy isn't so bad. COREY ROBIN: -- whereas, I think it actually accentuates the task that we have to now confront. COREY ROBIN: American liberals and Democrats have been fighting the right for a very long time. We've had different iterations of that right wing -- Barry Goldwater, Richard Nixon, Ronald Reagan, Newt Gingrich, George W. Bush, and now Donald Trump. COREY ROBIN: And, at every turn, there is an insistence that this is like something we've never seen before, and part of the reason for that insistence is a sense that this is how you rally the base. But even if we vanquish Newt Gingrich or George W. Bush, the terrain on which we’re fighting is getting closer and closer to what the right ultimately wants. BROOKE GLADSTONE: Is it because liberals and Democrats are constantly making this an issue of an individual rather than a web of ideas? COREY ROBIN: Absolutely. The comparison that I try to invoke is someone like FDR or Abraham Lincoln. These were realignment presidents, presidents who don't just run against a candidate, they don't even just run against a party. They run against a whole nexus or web of ideas and institutions, and they really want to take it out entirely and create a different kind of a country. When liberals make the issue Richard Nixon's individual perfidy or Ronald Reagan's distance from factual reality or George W. Bush's lack of command of the facts of what's going on, they are signaling to everybody, just get this guy out and maybe some of his people, as well, and all will go back to normal. And I think these are missed opportunities. You could imagine saying that Donald Trump and his treatment of women and his views on Muslims and people of color and his views on taxes, these are not singular aberrations. These are, in fact, connected to a whole set of ideas that have really governed us now, going back at least to the 1970s and 1980s, and that he reveals to us everything that has been wrong in this country for an extraordinarily long time and that in going after him we are gonna go after all of that. And instead, he gets cordoned off as this mess of a human being but we forget to see how that mess is emblematic of just a much, much larger mess that is this country. BROOKE GLADSTONE: I assume that people run against character because it helps them win elections. COREY ROBIN: I think it’s dawning on a lot of people that it's not enough just to win an election. You have to transform the country in a more fundamental way. BROOKE GLADSTONE: -- and not just a different coat of paint. COREY ROBIN: Yeah, exactly. One can see the strategic benefits, again, in the short term, but the task of liberalism and the left becomes ever, ever narrower. If America's already great, why do you need to increase taxes, redistribute wealth, to confront problems of schooling? What do you say about the fact that the United States is now more segregated than it was under Ronald Reagan? All of the factual tasks that are at hand that liberals traditionally would have wanted to take up suddenly are swept off the table. BROOKE GLADSTONE: Corey, thank you very much. BROOKE GLADSTONE: Corey Robin is a professor of political science at Brooklyn College and the CUNY Graduate Center. His book is called The Reactionary Mind: Conservatism from Edmund Burke to Donald Trump. That’s it for this week’s show. 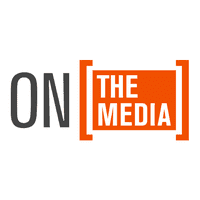 On the Media is produced by Alana Casanova-Burgess, Jesse Brenneman, Micah Loewinger and Leah Feder. We had more help from Jon Hanrahan, Philip Yiannopoulos and Isaac Napell. Our technical director is Jennifer Munson. Our engineers this week were Sam Bair, Terence Bernardo and Andrew Dunne. Special thanks to WNYC Archivist Andy Lancet. Katya Rogers is our executive producer. On The Media is a production of WNYC Studios. Bob Garfield will be back next week. I’m Brooke Gladstone.